A special task force on survivable logistics evaluated the military's current airlift, sealift, and prepositioned equipment and supplies and found major problems with supporting forces during a "high-end" conflict. "Since the end of the Cold War, the United States has not fought an adversary capable of the catastrophic disruption of military supply chains and deployment of personnel and materiel," an unclassified summary of the report states. "As a result, the [joint logistics enterprise] has suffered neglect and chronic underfunding relative to other DoD priorities." Additionally, the ability of strategic competitors to threaten military supply lines has increased with new and advanced weapons and missiles, as well as "gray zone" capabilities such as cyber attacks and space warfare. "Competitors and adversaries have already disrupted commercial logistics information technology systems," the report said. "Military and commercial networks are at risk." "Conflict against a strategic competitor will demand a dispersed and survivable logistics structure and robust IT systems capable of not only defending against cyber-attacks, but also safely sharing logistics information across military and commercial elements," the report said. The task force concluded that a logistics system for the military that can survive a future war will be essential for continued American power projection and for readiness to deal with threats from China and Russia. "Without a demonstrably resilient and survivable logistics capability, U.S. deterrence will suffer and the ability of the U.S. military to operate globally will be at stake," the report said. The report warned that American military readiness in recent decades "has severely decayed" as the result of budget cuts, misaligned funding priorities, a lack of incentives to protect the defense industrial base, and insufficient wargaming. The task force urged reversing course immediately to address one of the highest priorities of recently departed Defense Secretary Jim Mattis who sought to rebuild military readiness in pursuit of more lethal forces. The 29-page report was made public in November and is the executive summary of a longer, classified study. Craig Fields, chairman of the Defense Science Board, said the future of warfare is changing rapidly and the Pentagon will need to adapt quickly to deal with conflict conditions less favorable to the United States than in the past. "Survivable logistics is the key enabler underpinning all U.S. military power," Fields said. "Without the ability to provide our soldiers, sailors, airmen, and marines with the resources needed to win on the battlefield, the development of advanced tactics and technologies will not have the opportunity to matter." Retired Army Gen. Paul Kern and retired Air Force Gen. Duncan McNabb, co-chairmen of the task force, said logistics problems need urgent attention. "The task force found significant shortfalls that, if left unaddressed, will put at risk U.S. ability to project power and sustain the fight against a strategic competitor," they said in a foreword to the report. The generals said one major need is increased information security for logistics networks. "Military and commercial networks are susceptible to espionage, manipulation, and attack by adversaries," they stated. "Logistics data is neither as accessible nor used as efficiently as it should be. Technological solutions to these problems already exist, or will exist in the near future. The DoD must adopt them quickly." In 2012 and 2013, Chinese military hackers broke into computer networks at the Transportation Command, the command in charge of most logistics, and stole valuable information that could be used in a war to disrupt U.S. troop and equipment deployments. A Transportation Command spokesman did not directly address the findings of the report. "We are continually assessing and improving DoD's ability to project power globally, which remains our nation's comparative advantage, providing multiple options to our national leadership and multiple dilemmas to potential adversaries," said Navy Capt. Kevin Stephens. The task force report urged modernizing the logistics "mobility triad" to bolster warfighting capabilities. "The mobility triad, which includes sealift, airlift, and prepositioned assets, is plagued by readiness issues and shortages that must be addressed in order for the United States to defeat a strategic competitor," the report said. The study noted that commercial ships and vessels used for logistics have been shrinking for decades and will decrease by 50 percent from current levels by 2033. A Civil Reserve Airlift Fleet, a key element of the logistics system, is part of the logistics system used to move troops and bulk air cargo in war time. However, both the air fleet and sealift commercial ships have not been tested in war games to determine how they would survive a large-scale conflict involving the shootdown of aircraft by missiles and fighters or transport ships sunk by submarines. "Accounting for attrition, [anti-access, area-denial] threats, and risks to commercial civilian airmen and mariners requires wargaming and solutions," the report said. Anti-access and area denial weapons include advanced, precision-guided missiles, air defenses, fighter aircraft, submarines, and asymmetric warfare capabilities such as cyber attacks and anti-satellite missile strikes. Taken together, the weapons could prevent the U.S. military from mobilizing, communicating, and moving forces during a major conflict. 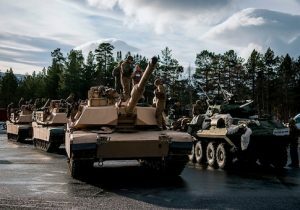 Additionally, the Pentagon's current policy of storing weapons and equipment overseas closer to potential front lines does not meet the current demands of the Pentagon's new national defense strategy. Prepositioning plans need to be updated, the report said. Such stored equipment and weapons also are vulnerable to attack in the earlier stages of a conflict. "The use of deception and ‘hiding in plain sight' by our adversaries should be considered," the report said. "Opportunities exist to leverage commercial networks and vessels for DoD prepositioning." The report urged the Air Force and Navy to develop new tactics, techniques and procedures with U.S. flag carriers for convoy operations, such as long-range maritime patrols, to protect mobility forces and secure air and sea lanes against high-tech threats. The Joint Staff and Transportation Command also were urged in the report to develop new and innovative plans for long-range distribution of warfighting assets, such as mobile basing, airships, joint high-speed vessels, autonomous barges, and precision air drop capabilities. To solve transport shortage problems, the task force urged re-opening production lines for more cargo aircraft to better protect against loss in war. The panel also recommended bolstering the service life of commercial fleets. Better preparations are needed for moving forces in a major conflict and the Army and Marine Corps should develop better prepositioning systems at sea and on land. One option recommended by the task force is to put an infantry brigade combat teams aboard roll-on/roll-off ships and related equipment on other ships and on land to support the both the European Command and Indo-Pacific Command. To save money, more roll-on/roll-off transport ships are needed, and used foreign ships that cost around $25 million should be purchased instead of building new U.S. ships that would cost up to $850 million each. The task force emphasized the need to bolster logistics systems and supporting industrial base in the United States as a first step in preparing to wage war. "If the homeland industrial base, electrical grid, or any other critical infrastructure is compromised, military forces will not be able to arrive in theater on time or at all," the report said. "Therefore, it is critical that attention to survivable logistics begin at home." The report urged the Pentagon to use artificial intelligence and machine learning to bolster military logistics using predictive analysis, demand forecasting, production scheduling, anomaly detection, and supply-chain optimization. To counter cyber attacks, the task force urged developing the use of blockchain technology that allows digital information to be shared but not copied. A blockchain-like test infrastructure for military logistics would enable the Pentagon "to evaluate potential offensive and defensive cyber applications of blockchain-like technology and other distributed database technologies," the report said. Ed Timperlake, a former Pentagon logistics official under President Ronald Reagan, said the task force report and its recommendations show the strategic brilliance of the Defense Science Board. "As President Reagan's principle director of mobilization and requirements, an office eliminated during the Clinton administration's ‘peace dividend' years, failure in logistics can not only limit the ability to fight a peer-to-peer war but can mean the difference between victory and defeat," Timperlake said. Dakota Wood, a defense analyst at the Heritage Foundation, said the report on military logistics weaknesses was not surprising. "Logistics is the poor step child of the military," Wood said adding that logistics systems often are short-changed in administration and congressional budgeting processes. Fighters and warships often get more budgetary attention, he noted. For example, vital KC-135 aerial refueling tankers were built beginning in the 1950s and their replacement, the KC-46 has faced repeated development delays. The Defense Science Board "is saying that if you want to be effective in war we do not have the material capacity to sustain that initial combat power surge and sustain that over time," Wood said. "And it's going to take a long time and a lot of investment to get to where we need to be."